1. We urge the Government to facilitate dialogue by lifting curbs on the media in Balochistan. 2. We call upon the media in Pakistan to address the situation in Balochistan with sensitivity, empathy and fairness and to facilitate a civil discourse. 3. We demand a public apology from Kamran Shahid, the producers of Frontline, Express TV, Barrister Saif and APML and all channels to boycott Mr Saif until he apologises publicly for his remarks. We also urge the APML as a responsible political party to apologise for his excesses. 1. We call upon the Government to lift the curbs on the media in Balochistan and allow voices from the troubled province to reach other parts of the country. Lift the ban on The Baloch Hal, an online publication that advocates dialogue and non-violent protest. Direct the security agencies to stop preventing the circulation of the Urdu daily Tawar (headquartered in Karachi) in Balochistan, and to stop threatening journalists, news agents and newspaper sellers in Balochistan associated with the paper. 2. We urge Pakistan’s media to lay down clear guidelines to ensure civil discourse and discussion by active, informed moderation rather than passive presence. Inflaming discussions for commercial benefit or the persistence of a lazy editorial process is a disservice to viewers, the media house itself and in this case, the Baloch people and all of Pakistan. 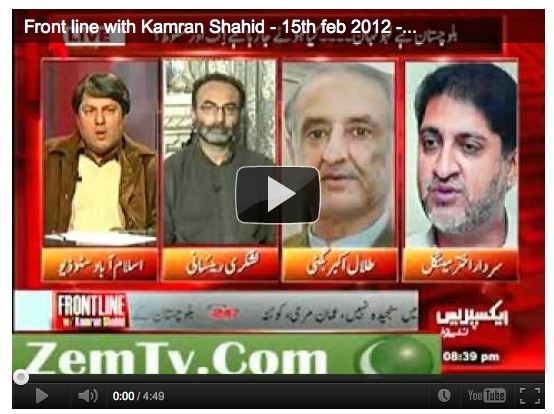 In this regard, Express TV’s talk show “Frontline” of Feb 15th, 2012 hosted by Kamran Shahid, merits special mention for being inflammatory and unprofessional, by allowing, even encouraging, an abusive exchange to take place that was not only unbefitting to any respectable current affairs programme, but is also likely to fan the flames of conflict in Balochistan. We unequivocally condemn the language used and the intent of one of the studio guests, Barrister Saif Ali Khan of the APML, as well as the irresponsible and unethical conduct of the host Kamran Shahid. Instead of moderating the highly charged, threatening and aggressive comments of Barrister Saif, Mr Shahid appeared to add his stamp of approval by suggesting that Mr Saif had raised some “valid” points. This is not the first time that Kamran Shahid has tried to discuss a serious and controversial issue with an approach which can be described as amateurish and ratings-driven at best, or incompetent and unprofessional at worst. The fact that two other guests of the show, registered their protest and exited the discussion, suggests that Mr Saif’s comments cannot be explained away by the “heat of the moment” or justified in any way by the alleged “validity” of any points he raised. We believe that the trouble was deliberately stirred by the host and producer by bringing a Musharraf supporter into direct conflict with Talal Bugti who is known to hold Gen. Musharraf responsible for the murder of his father Nawab Akbar Bugti. Mr Bugti’s remarks about Gen. Musharraf (as being ‘wajib-ul-qatl or ‘liable to be killed) cannot be condoned, but Mr Saif’s response was out of proportion to the unfortunate use of words by a bereaved and angry son. We find it amazing that the Frontline producers allowed the abuse to continue, rather than cutting off the sound of Barrister Saif’s microphone when it became clear that he was going to continue his abuse. Producers can also direct the host to stop such a diatribe. Instead, the camera zoomed into the faces of the host and the abusive guest in order to highlight the conflict, a tactic that appears to be designed to boost “ratings”. We believe that Express TV channel is a responsible part of Pakistan’s media landscape. Therefore, we expect the management to take due notice of this incident and initiate an impartial in-house inquiry which would hopefully culminate with a much required censure of the programme’s host. 3. (a) We demand a public, unconditional apology from Kamran Shahid, from the show’s producers, and from Express TV. 3. (b) We urge all channels to boycott Mr Saif until he apologises publicly for his remarks. We also urge the APML as a responsible political party to apologise for his excesses. This unfortunate incident provides an opportunity not only for Express TV, but for the other channels, to develop editorial and production policies that ensure that the anchor is aware of his/her responsibility to the viewing public, and indeed the organization that he or she represents, particularly in cases where guests abuse or threaten individuals, groups or organizations. The answer is not to stop raising the issue of Balochistan as suggested by Kamran Shahid’s tweet: “@FrontlineKamran: Regardless of any thing, the issue of Baluchistan will not be raised again from the platform of Front Line with Kamran Shahid”. On the contrary, we believe it is crucial now, more than ever, to raise the issues related to Balochistan, but in a sensitive and responsible manner. We are sure that given the sensitivity surrounding the coverage, debate and discussion of issues related to Balochistan, you will appreciate our concern that programming about the region should not be marred by controversy at the expense of the issues at hand. This is critical if the heartbreaking words of Nawabzada Lashkari Raisani, known to be pro-Pakistan, are not to be proved true: ”Balochistan aap sey bohat dur nikal chuka hai” (Balochistan has gone very far from you), he said as he left the offending Frontline talk show of Feb 15, 2012. Dr. Fatima Afridi, Physician, U.K.
FYI: Talal Bugti did not order or endrose the killing of Musharraf but he referred to an earlier fatwa issued by some ulema, as reported in Dawn story. Ismat..united we stand…divided we fall….let’s wake up to ground realities..the life of the poor Baloch is not going to became a fable overnight…the poor there have been living in shackles of a brutal Sardari system that wil not let them educated……there are vested interests involved here.a very carewfully planned and orchestrated move to destroy Pakistan into 4 smaller balkan type of states..sadly you are so ill informed, naive, or working for “them”…. We all need to step up and do our bit to bring about a change .. The lesson of history is clear: democracy always wins in the end.